The future is now. With a revolutionary new ski construction using carbon fiber infused thermo-plastic, ASKI has leapt onto the scene with an amazing new ski line. Already receiving rave reviews in Europe and at Skimo Co, the skis are virtually guaranteed to put a smile on your face. Stealth describes both this race ski and the way that Aski snuck up on the skimo world. Seemingly out of nowhere, the Italian company is cranking out a full line of amazing skis using an innovative construction process. After years of research and develop.. Virtually guaranteed to put a smile on your face, the Aski Verglas is stable, precise, and confidence inspiring in variable conditions and steep terrain. A carving skiers dream, the Verglas probably could hold an edge on glass. The skis are built with a s.. The Aski adjustment plates let you move otherwise-fixed Dynafit-style ski bindings. This lets you use multiple boots or can help work around existing drill holes in your ski. 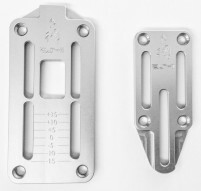 The adjustment plates rely on bolt-tension to hold the toes or heels in place. S..